Learn more about the International Buddhist Temple. 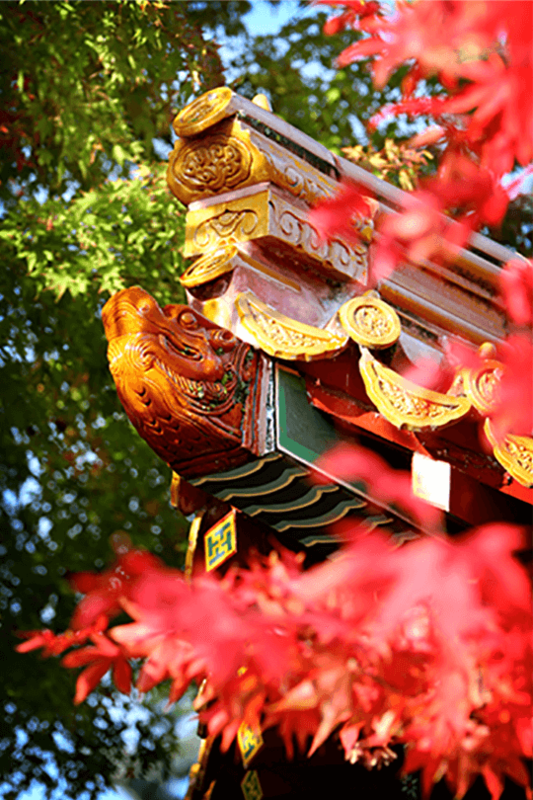 Widely regarded as the most exquisite example of traditional Chinese architecture in Canada, the International Buddhist Temple is in many ways like a work of art taken straight out of Chinese history. As a magnificent structural complex modeled after the Forbidden City in Beijing, China, the temple features Chinese imperial architecture in all its glory. Combining intricate stonework and symbolic carvings with the elements of nature, the tranquil grounds resemble a scholar’s courtyard in ancient China. Inside the artistic interior of the temple, admire the finest Chinese workmanship in painting, calligraphy, sculpture and carpentry. Discover traditional Chinese art and culture in majestic Buddha statues, exquisite shrines and spectacular ceramic murals. Come experience what the temple has to offer. Come and inspire your mind and spirit! Learn about our ceremonies and rituals. The International Buddhist Society offers a variety of services to the local and international community. Interested parties are welcome to participate in regular Religious ceremonies, Dharma talks and meditation retreats at the temple. Or, you may come to appreciate Cultural gems such as our classical Chinese garden, as well as a plethora of celebrated Chinese paintings, calligraphy and sculptures. We also encourage you to benefit from our Educational services by attending classes and Dharma talks held by the Venerable Guan Cheng, many of which are available on our website under Lessons. If you would like to take part in our current charity programs and help us with all of the above services to the Community, please register to become a volunteer at the temple. Buddha of Medicine chanting ceremonies are held in the Main Gracious Hall. On New Moon and Full Moon Days of the lunar calendar, additional chanting ceremonies of the Great Compassionate Repentance are conducted. The temple holds various ceremonies and services on special lunar calendar days in accordance with traditional Mahayana Buddhist rituals. Please see our Calendar for specific dates. Three times a year for several days each, special chanting services are held to commemorate the ancestors in the Main Gracious Hall. Our Ksitigarbha Hall (Ancestral Hall) is also used for memorial and chanting services for the departed. We uphold the virtues of filial affection and sense of duty to the ancestors. There are two kinds of religious service that the monks and nuns at the temple can conduct for the deceased: chanting the Amitabha Sutra, or chanting the Ksitigarbha Sutra. Ancestral tablets with the deceased’s name (with or without a photograph) can be also placed in the temple. With their names engraved onto wooden or plastic tablets, those who have passed on will be able to listen to the prayers of the monks and nuns everyday. As prayer services involve the chanting of sutras, the departed will benefit from recitations of the Buddha’s teachings so that they may too become enlightened and eventually enter Nirvana. Please contact a temple representative for more information. Daily prayers are held at 5:00 AM, and 6:30 PM in the Main Gracious Hall by Sangha at the temple. Periodically, Venerable Guan Cheng conducts a ceremony for people who wish to take refuge under the Buddha and receive the five precepts. Those interested should retrieve a form from the Gracious Hall or access one online. The ceremony takes place in the Meditation Hall and lasts for approximately two hours, during which time the Venerable leads an initiation ceremony and describes the meaning and significance of becoming a disciple of the Buddha. The temple hosts several types of Buddhist meditation, chanting and short-term ordination retreats throughout the year. During the retreat, followers meditate, chant, and attend Dharma talks delivered by our abbot. For more information on our upcoming retreats, please visit Upcoming Events on our website. Classes on meditation emphasize the need for inner peace and purification of the mind. They are held every Saturday morning from 9:00AM to 11:00AM. In the first hour, students learn to refine various meditation methods, such as seated meditation, walking and chanting meditation. The last hour is usually reserved for Dharma talks and discussions on Buddhist philosophies or sutras. Dharma talks (in Cantonese or Mandarin) are given during the Sunday lunch hour. View our learning resources and texts. Our Abbot, the Venerable Guan Cheng, has held many Dharma talks on various Buddhist topics including meditation and specific Mahayana scriptures (Sutras), in both English and Chinese. Dharma talks in English are delivered every Saturday morning during a class called Buddhism & Meditation, while Chinese language Dharma talks or lecture series take place several times throughout the year. See the Sign up now for details. Videotapings of Dharma talks in both English and Chinese can be accessed from our Lessons page. These radio Dharma talks are also available for download via our Lessons page. The Abbot hopes to produce video vignettes of his radio program. By combining sound and image, and using Chinese subtitles, the Venerable Guan Cheng offers another way to understand the Dharma for people who prefer to learn through visual means. See sample Dharma talk videos on our Lessons page. Explore the beauty of Buddhism. Buddhism is, at its depths, a grand philosophy of life. It encourages all sentient beings to transcend life’s sufferings by casting away desires and mental afflictions and thereby embark on a journey to attain the ultimate level of spiritual understanding. Buddhists refer to this as the state of “Enlightenment”. As each of us treads this path, we must take responsibility for our own actions and choices, even beyond our current lifetime, while practicing compassion to all living things. It is no wonder that, since its introduction to East and South Asia, Buddhism has flourished in many countries over long periods in history. The International Buddhist Society is proud to play a part in Buddhism’s fast-growing popularity and acceptance in Western culture. We will continue to strive for Enlightenment, while helping others, both locally and internationally, to do the same. Our renowned classical Chinese garden of bonsai, fountains, gazebos, and intricate rock landscapes is open everyday from 9:30 AM to 5:30 PM. We hope to express the profound philosophies of Buddhism through the art of traditional Chinese horticulture. Our Abbot, the Venerable Guan Cheng, is an avid gardener and has been actively involved in the artistic elements and planting design of this garden from the start. The abbot’s remarkable designs and creations are deeply influenced not only by his familiarity with Chinese art and culture, but also by his decades of Buddhist study. 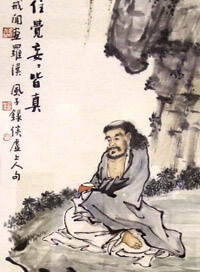 The temple has an extensive collection of Chinese paintings and calligraphy, donated by master artists and calligraphers who attended the temple’s monthly art exhibition, Karma of the Brush. The exhibition was held from 1986 to 1991. We show compassion to all living things by abstaining from the consumption of meat. We also promote the religious merits and health benefits of vegetarianism by giving our visitors the opportunity to enjoy vegetarian cuisine at the International Buddhist Temple. The Taste of Zen is on the ground floor of the Thousand Buddha Hall, and is open seven days a week, from 11:30 AM to 3:00 PM. Our chefs are skilled in the art of Chinese vegetarian cuisine and offer visitors many exquisite dishes to choose from. The International Buddhist Temple celebrates Senior’s Day each year, in honour of Greater Vancouver’s senior citizens. On this day, we offer all seniors with a Gold Care Card a special vegetarian lunch and scheduled entertainment, free of charge. This event is increasingly popular and more than 2,500 seniors have attended to date. For the first two weeks of the Chinese New Year (or Spring Festival), over 10,000 people visit the temple to pray for a safe and prosperous new year. Visitors can also explore the temple’s New Year Bazaar, a grand festival that offers traditional snacks and foods, flower arrangements, Chinese calligraphy demonstrations, exciting raffles, and much more. On the eve of every Chinese New Year, our abbot leads a special group prayer and chanting ceremony held in our packed Main Gracious Hall to bless all sentient beings for the coming year. Take a guided tour of the temple. We offer guided tours for groups of 15 or more, to help visitors learn more about our temple and Buddhist philosophy. Tours may take place any day of the week, and any time from 10:00 AM to 4:00 PM. Written notice is required. Each tour lasts approximately 60 minutes, during which time our staff or volunteers will guide visitors through the grounds on an enlightening journey of Chinese art, culture, and Buddhism. To book a tour, please fill out the Tour Request Form. Please note that we do not accept guided tour requests over the phone. Tour requests may only be submitted via our website. After receiving your request, we will check our availability and reply to confirm your booking. Please allow us a few days to respond. Thank you for your interest in the International Buddhist Temple. We look forward to your visit!